Tallinn is the destination full of history, beautiful pastel colored houses and it has a quirky contrast between old and new. 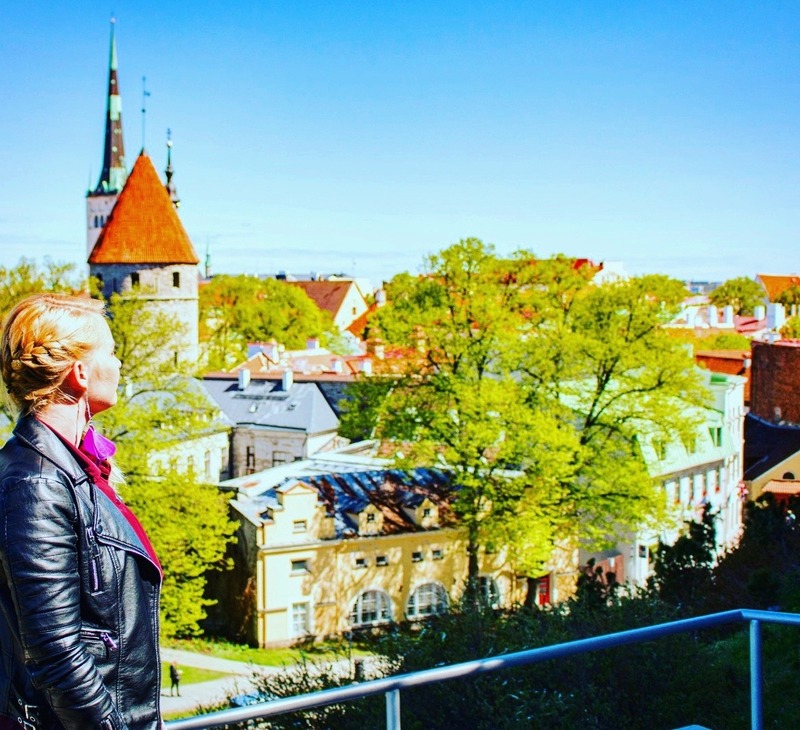 Follow my steps and get a glimpse of what Tallinn has to offer! TIP: Press the steps and find your way to my favourite places! 👣 Let’s start with Old Town which is THE place to visit! In the peak months the small streets of Old Town might get overcrowded but it will be worth it! My suggestion would be to travel to Tallinn on May, June or September. Then you can avoid the crowd but still enjoy the beautiful summery city. One good tip is to take comfy shoes. High heels will be difficult on the bumpy roads that are made of rocks. Tallinn has such a cool fortress that I could’t stop exploring it! 👣 In the Old Town the best things to see are the pastel colored houses. I love to spend hours just discovering more and more beautiful houses and architecture. There are many amazing old churches located in the area. To my mind the most beautiful one is the Orthodox Church called Alexander Nevsky Cathedral on top of the hill. The best view is from the Olavisten church that has a balcony with a full 360 city view. The climb up to the tower is pretty tough but definitely worth it! These walls are amazing in color! 👣 Few of the most interesting museums I’ve been to are in Tallinn like the KGB Museum and the Museum of Medieval Torture – I’m not kidding! The KGB Museum is located inside Viru hotel right in the heart of Tallinn. But don’t walk around on your own, join the guided tour! The guided tour is 12 euros for non-guests and 9 euros for guests and I think it was worth every cent. I learnt so much about the times when KGB was fully active and how it operated within the hotel and how exactly did they eavesdrop on people. Definitely recommended! The Museum of Medieval Torture was the first museum where I’ve really used time to read those introduction cards that tell about the piece I’m looking at. So horrible but so fascinating! Good tip but I didn’t do as it said, right – haha! 👣 Viewpoints are a must on your trip to Tallinn! There are several of them and some more crowded than others. They are located on top of the hills overlooking the Old Town. When you pass a narrow street of amber shops there is a very popular viewpoint that has an excellent view to the city (Kohtu 5). I would highly recommend to also continue your journey past that one since there is another good spot coming just after a few minutes walk. The Patkuli Viewing Platform is usually not so crowded and it also offers a view to the Baltic Sea. There’s also a staircase from Patkuli that will take you back down from the hill in case you don’t want to backtrack your way on the rocky roads. Tallinn has such a pretty skyline! 👣 I’m sad to inform you that the best museum I have EVER been to has been closed. Patarei Sea Fortress Museum was the gem of Tallinn and unfortunately they have been forced to close the museum for now. Patarei fortress was built in 1840 but it was used as a prison from 1920 until 2002. It was the most interesting place to visit in Tallinn! The discussion is still ongoing what will happen to the fortress and what will be the future use for it. For now I can only suggest to walk the coastline towards the fortress since you will have cool places to see on the way. If you want to I assume it’s possible to see the fortress from the outside. I’m really hoping for the fortress to be reopened SOON. Estonians did a huge mistake for closing it. Closing it is a huge misfortune for the local tourism. My favourite room in Patarei – room full of paper planes. 👣 Shopping shopping! If you want to go shopping in Tallinn you can stay in the center since most of the shops can be found there. If the weather is really poor you can head to Rocca Al Mare shopping center. There is a large variety of shops available. Personally I prefer shopping in the center because there are better restaurants available if I get hungry while shopping. 👣 Jaama turg is a market place in Tallinn city center and it is the place to find local delicacies. It is located behind the Old Town so it is within walking distance. Would you like to find a piece of mouthwatering smoked cheese or fresh berries? Then add Jaama turg to your list. 👣 Looking for food? If you want DELICIOUS food inspired by medieval times go to Olde Hansa! It’s THE place to go to. I’ve been there three times and I haven’t been disappointed once. When you step into the restaurant it if feels like you have just arrived to another era. The decoration is like from the old times, tables are thick wood and every table holds a candle. The food reflects the era so there are for example no potatoes available but there is a large variety of food ranging from forest mushroom soup to wild boar. The waitresses are dressed up in the medieval costumes and the best part is when the music starts. Take the trip to the medieval times and have the restaurant experience of a lifetime! I’ve heard that many of the restaurants situated near the main square of Old Town aren’t well managed because customers will come to them thanks to their great location. That felt true with Gastropub Clayhills during my last visit to Tallinn. Just stay away from that restaurant. But there is at least one exception and that is Olde Hansa that will take you back to the meal tables of medieval times. It’s THE place to go! Olde Hansa – deliciousness in one medieval bite. 👣 A cup of coffee? Head to Must Puudel which is located conveniently in the Old Town. The decor of the cafe is quite unique with wooden elements and one wall decorated with big lighted letters. There is also an outdoor terrace with different cozy garden chairs. But more importantly the cappuccino I tasted was excellent and so were the cakes. There is also lunch available which I must say also looked really delicious. In addition the alcoholic drinks like beer and cider were quite cheap. 👣 Bonus tip: I would highly recommend you to make a trip combining Tallinn and Helsinki. There are 4 different ferry companies operating from Helsinki to Tallinn and you can get the ferry ticket usually under 20 €. The price depends on the season and the weekday you are traveling. The companies are Tallink Silja, Viking Line, Eckerö and Linda Line. Check out my tips also to the wonderful Amsterdam! That’s a good tip about Patkuli viewing point. Did you explore the rest of Teliskivi after Jaama Turg? I think it’s my new favourite part of the city. I also avoid most of the restaurants around the old town, except for III Draakon in the Town Hall. I find the restaurants along Rataskaevu (Kompressor, Aed and Rataskaevu 16) far more reasonably priced. Unfortunately I didn’t this time but I think Telliskivi deserves to be listed . 🙂 Maybe I have to do Part 2 Tallinn article! I’ve also heard that those restaurants are good that you mentioned and I’d like to add Vegan Restoran V to that list which is a really good vegan restaurant! Awesome Tom! I’m really glad you enjoyed reading my article! I’ve actually heard about the segway tour (with or without a guide) before and that would definitely be a must-do in Tallinn also for me. 🙂 Was it easy to go with the segways even though the streets are a bit bumpy? Awesome to hear that! I’m so glad you enjoyed reading my post! Your article about capital city Tallin is very informative and useful. Due to the shortage of time, passed thru Tallin to reach Tartu about 200kms from Tallin during peak winter time that too during midnight. Enjoyed Estonia very much. People have been kind and helpful. Next time I will visit Tallin for sure and thanks to you. I’m glad you enjoyed my article and learnt something new by reading it! 🙂 I hope you’ll get the chance to visit Tallinn one day! Beautiful article and picturs. Tallin is a place I really want to visit some day.